Recent footage of for-sale Hammerhead sharks at a Chinese fish market has made headlines — and reignited discussion about the problem of shark finning. On the morning of April 9, hammerhead sharks were spotted for sale at a wharf in Sanya, Hainan province. The video quickly circulated online, mainly because hammerhead sharks are considered a globally endangered species — and because it called to mind how consumer tastes have seriously threatened shark populations over the years. In the Coral Triangle in the Indian and Pacific Oceans, 100,000 tons of shark fins are harvested each year. Once a shark is caught for its fin, the animal is usually thrown back into the sea where it bleeds to death. 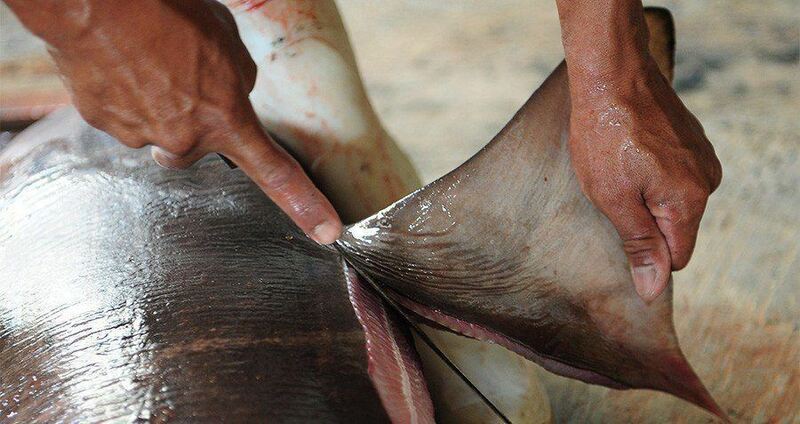 Because of practices like this, shark finning is tightly regulated and even banned in the European Union, United States, and Australia. At the market in Sanya, witnesses say that about 100 sharks were piled up on the ground, where they were being sold at about two dollars per kilo. The local fishery department confiscated the sharks later in the day. Despite occurrences like this, steps are being taken to help conserve shark populations. No-Take Zones (NTZ) ban fishing for sharks or any reef fish. And they seem to work: According to Frontiers in Marine Science, the number of sharks in these NTZs are 28 times higher than in areas that are open to fishing. But given how lucrative the shark-finning industry is, the NTZs may not be enough to dissuade fishermen from hunting sharks. While any given fisherman may not be getting rich, all told, Humane Society International estimates that this industry generates approximately $500 million in profits each year. Next, watch footage of the biggest great white shark ever filmed. Then, read about other endangered animals you should know about.